Are you still looking for the ever elusive ZHU ZHU PET? CVS will have them in stock and on sale between Dec. 6th (today) and Dec. 12th for only $9.99 ea., bed or carrier for $6.99 ea. and add - ons for $17.99 ea. We would suggest you call before you go! You will find the weekly ad in the store, you will need to pick it up to use the coupons. You can also view the ad and print the coupons online here. I will be on the lookout for a great to tell you all about with this $10 TinkerBell & The Lost Treasure printable coupon. You have to be a Disney Movie Reward member to access the coupon but if you aren't already you can join HERE for free! You will have to enter the code GIFT to get the coupon. To make this even better, combine it with the $5.00 Blu Ray coupon on Target.com. 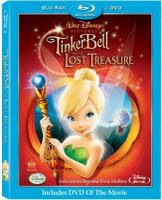 Hopefully their will be a sale on the TinkerBell movie soon! You can also use this $5 rebate wyb any two (2) participating Kernel Seasons products! Look For Zhu Zhu pets at CVS! This year one of the hottest games is Giraffalaff Limbo ! I have seen it in stores for $39.99 but today on Amazon.com it is only $11.88 with free Super Saver Shipping if you spend $25 or free shipping with Amazon Prime . Inside Redbox is reporting that the code below is working for a free rental. I haven't used this code yet so let me know if it works for you! Remember you can use this multiple times by using different debit/credit cards. If you register with Redbox you will receive a free movie that is redeemable any day of the week and you can search for the closest Kiosk.